Options Include: Malibu Monsoon M6Di Motor w/ High Altitude/Torque Prop, Surf Pipe Exhaust, Transom Installed Engine Flush Kit, 5-Outlet Heater, Bimini Top w/ Extended GEN II Surf, Boat Cover w/ TAPS 2 & Swimboard Cover, Black Wakesetter Hull Graphics, Stereo w/ Satellite Radio & Antenna, 23" Subwoofer w/ Amplifier, Transom Remote, Wetsounds Icon 8 Tower Speakers (2 Pairs), 500w Tower Amplifier, G35 Tower w/ PTM Clamping Board Racks, Black Tower Hoop, Tower Mirror (140 Degree Panoramic), Ballast Options Including Bow, Midship & Rear Malibu Launch System, PNP Plumbing w/ Auto Vent & Dual Rear PNP Ballast Bags, Surf Gate w/ Malibu Surf Band, Power Wedge III, Deck Trac Nonskid Complete Deck Kit, Stainless Steel Cup Holders, Power Lift Helm Seat w/ Swivel & Slide, Sterling Soft Grip Flooring, Wireless Charging Stations, Sport Dash w/ Rotary VDC 4-Way Joystick, Wide View Back Up Camera & DT1 Bow View Camera, Zero Off GPS, Wake View Bench Seat w/ Integrated Table, Dual Batteries w/ Isolator Switch, Flip Down Step on Swim Platform, (3) Pair Pull Up Cleats, V-Drive Pylon, Docking Lights (LED), Underwater Blue Transom Lights, Upgraded Trailer w/ 18" Wheels, Matching Spare Tire w/ Side Carrier, Bow Step, Retractable Transom Straps, Transom Step w/ Slimline LED Lights. This hull was designed specifically for boarding applications and allows the boat to sit deeper in the water at slower speeds, which allows for more water displacement, creating a bigger wakes and surf waves at all boarding speeds. Malibu’s new steering wheel controls ISP, stereo volume, cruise control for the ultimate in convenience. The Command Center is the smartest combination of digital interfaces and traditional controls in the category. The bright, high-resolution 12-inch MaliView touchscreen gives you finger-tap control of the ballast, Power Wedge III and Surf Gate. New for 2019 is the ability to wirelessly charge your phone in a newly designed holder. Built by Malibu, the all-new Malibu Gx tower introduces an industry standard for innovation and quality. Turn the dial to raise or lower the tower in 9 seconds, half the time it takes for the competition. With 8 total positions, the New Malibu Multi View Bench Seat converts from a normal seat to a rear-facing seat more simply than ever, and also converting into a table. This high-definition rear-view camera is located on the transom, so you can always keep an eye on what’s happening behind the boat for increased safety. Footage is viewable live on the MaliView screen. 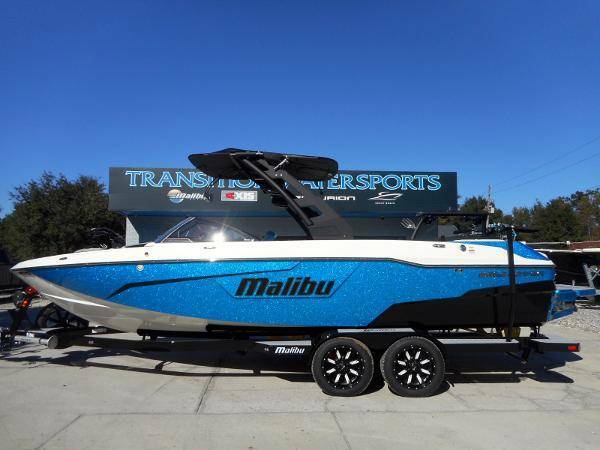 Malibu’s exclusive ISP starts with Model-Specific Performance Hulls, Quad Hard Tank ballast, and Malibu's exclusive Power Wedge III and Surf Gate. Control it all with the touch of a finger using the Malibu Command Center and our exclusive Surf Band wrist remote. BIGGER IS BETTER WHEN IT MEANS PRODUCING HUGE, CLEAN WAKES AND WAVES. CLICK THE LINK BELOW TO SEE MORE INFO AND PHOTOS ON THIS MALIBU! I wanna see the 23” sub!! !